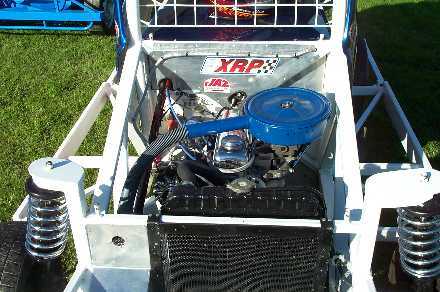 Ministock 35a was built at home by Dad & I and is a copy of a Westbury Chassis. The Chassis is now 2 & 1/2 seasons old and still straight. The only steel work that has needed to be done was a replacement front bumper at the end of last season and the side rails pushed out with the Port a Power. The only changes to the car this season has been the adding of an oil light, New Corvette body and a quick release steering wheel. The engine this season was was built by lance Jennings after we detonated the original at the end of last season, when the oil Filter fell off and I kept my foot flat.